I had just half an hour to rustle up something for dinner tonight. A one dish meal would work well I thought. Looking in my pantry, I found quinoa and I had shrimps in the fridge. So this recipe inspired from “Pinch of Yum” seemed just right to make….simple, nutritious and delicious. Cooking the shrimps in garlic butter just adds the perfect flavor to this dish! 1. Wash and keep the quinoa aside. Heat the oil in a large pot over medium heat. Add the chopped onion and saute till it changes color. Add half the minced garlic and stir for another minute. Now add the quinoa and 1/2 tsp chilli powder, salt and pepper. Mix well. Now add the broth. Bring to a boil, cover and cook for 15-20 minutes till quinoa is cooked. Fluff with a fork and toss with fresh chopped cilantro. 2. While quinoa is cooking, take 1 tbsp butter in a large skillet over medium heat. When butter has melted, add the rest of the minced garlic and saute for a minute. Now add the shrimp and sprinkle with the remaining 1/2 tsp chilli powder. Season with salt and pepper till shrimps turn golden brown on the outside. 3. 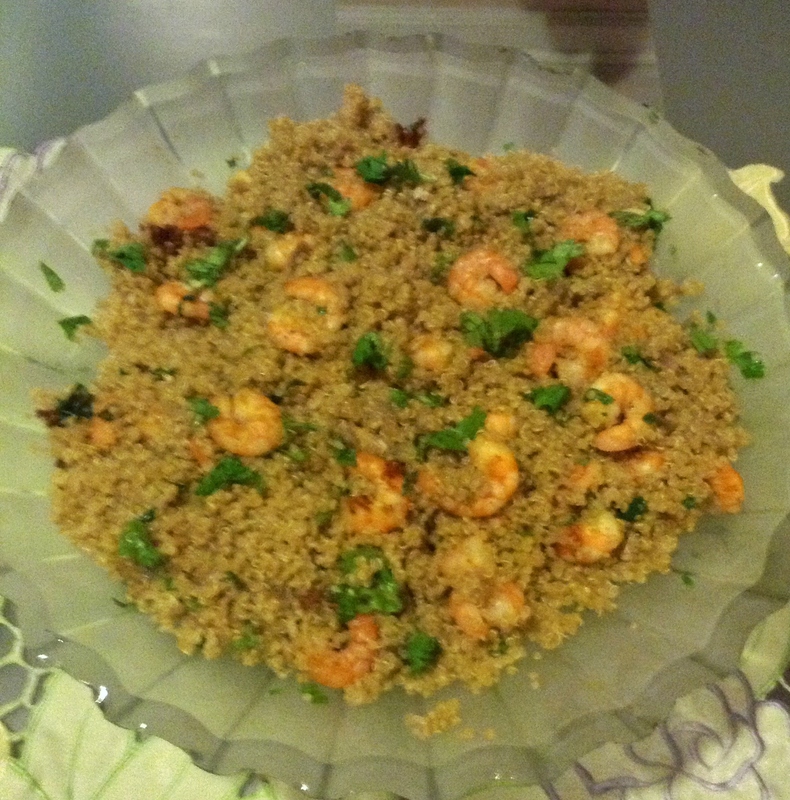 Now toss the shrimps and quinoa together and top with cilantro and lemon juice. Serve hot.